Fear not friends, here at SaneBox we’re very familiar with the deluge of emails that plague the inboxes of the unprepared. We’ve got our own way to slash and burn through that myriad of messages — we call it SaneSnooze, and it will revolutionize how you respond to email. The principle behind SaneSnooze is deceptively simple — if you don’t need to act on an email right now, you can “snooze” it until you do want to respond. 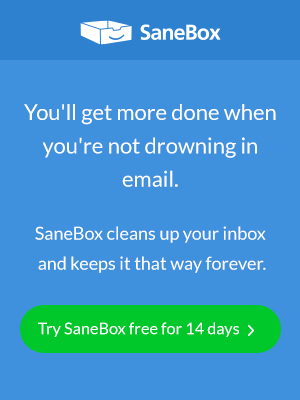 SaneBox will then hide the email until the time you specify when it will pop back into your inbox, hungry for attention! The key word here is “prioritization” — if you can’t, or don’t want to act on an email straight away, remove it from your attention. All the time it’s hanging around in your inbox, it will be quietly taunting you, forcing you to scroll past it whenever you want to get on with reviewing your messages. SaneSnooze is the solution. With just a little drag and drop the email will be silenced — it will automagically disappear from your main inbox folder, only to reappear when you’re refreshed and ready to deal with it. There’s nothing wrong with prioritization or hiding an email. It’s an effective way of managing the limited time and energy you have and focusing it on the things you can move forward right now. Think of SaneSnooze as a handy assistant that quietly says “not now” to the things you’re not quite ready to deal with. SaneTomorrow — snooze emails until tomorrow morning. SaneNextWeek — snooze emails until next Monday. A particular day of the week. A particular day of the month. As you’d expect with SaneBox, using SaneSnooze is frighteningly simple and intuitive. Sign into your SaneBox account. Go to your Dashboard and select Folders and Features. Turn on SaneTomorrow, SaneNextWeek, or your own custom snooze folder, depending on your snoozing needs. A box will pop-up to confirm you want to take that action. Once you have enabled the snooze folders you want, you can use the dropdown at the top of the snooze folders area to tell SaneBox what you want to do with emails once they have finished snoozing. You can also add a custom SaneSnooze folder to snooze emails for as long as you need. We now offer an option to send out an auto reply to your contact to let them know that you received their email and will respond to them shortly. 1. Visit your Folders page. 2. Under your Enabled Snooze folder, select Enable Auto Reply. 3. Check the Enable auto-reply box. 4. Edit the message that SaneBox will send to your customer and click OK.
5. Now when you snooze an email for this snooze folder, SaneBox will send out this message to your contact during our next processing of your account. Here are the rules for when we will send auto-reply messages. Absolute snooze folders – @SaneTomorrow, @SaneNextWeek, or any snooze folder that will put messages back in your inbox at a specific time. Relative snooze folders – @Sane3Days, @Sane1Week, or any snooze folder that will put messages back in your inbox relative to the time that the message was put into the folder . We will send an auto reply to a given contact only once per hold period. We will send an auto reply to a given contact every time an email is put into that folder. We will NOT send an auto reply to any contact that has opted out of all SaneBox emails. We will NOT send an auto reply to any contact that has opted out of auto-reply messages for the given snooze folder. Why not give SaneSnooze a try today and get rid of those pesky emails until you want to deal with them on your terms?